Spectacular. A bold star within a star is discovered in this estate Ponte Vecchio Gioielli yellow gold star ring. Let her know that you feel she is your shining star with this special heavy yellow gold ring. 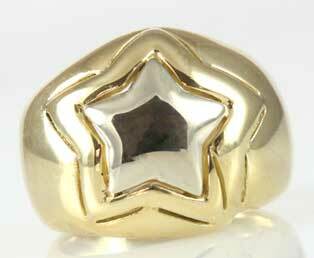 This bi-color gold star ring features a lighter gold star framed by a rich yellow gold star - all crafted in 18KT 750. Slight open sides surround both five point stars. Ponte Vecchio Gioielli started in Florence, Italy about 35 years ago. They are proud to offer multi-dimensional jewelry that is striking. They make their jewelry for the woman that no longer wants traditional, classic jewelry. Measures: 3/4" north to south, 7/8" left to right, 3/16" height above finger. Circa: Contemporary ring in excellent condition.